September is National Family Meal Month and is a great time for families to make renewed efforts to enjoy the benefits of conversing and eating together. There are few greater investments parents can make in their family than sitting down together and sharing a meal. Let’s bring back this lost tradition to Utah’s homes. 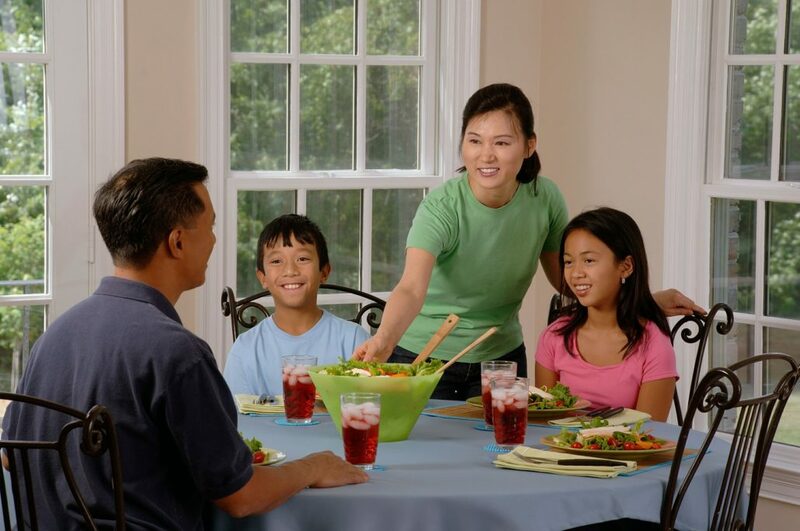 Children who participate in consistent family mealtimes eat an overall healthier diet, perform better academically, develop larger vocabularies; along with less likely to engage in risky behaviors including tobacco, drug, and alcohol. Children are less likely to struggle with eating disorders and less likely to experience depression or low-esteem. Parents who engage in family mealtime have overall healthier diets, enjoy strengthened family bonds and less money is spent on food by eating at home. Remember, family mealtime is not only for dinner – it can be whichever meal works best for your family’s schedule. Come join our Create Better Health Classes this fall, the last Thursday of each month excluding December. Each class will be combined of three components. A nutrition topic based on the dietary guidelines, a physical activity, and a Create recipe demonstration and samples. Classes will last approximately 1 to 1.5 hours. With regular attendance to the classes, you will receive cooking recipes and kitchen appliance/tools. Registration can either be done online at https://goo.gl/forms/N5QeH8DuOLsOF9tr2 or call the office at 435-781-5452.